The 1000-franc note focuses on Switzerland’s communicative flair – expressed by language, the note’s key motif. The handshake signifies interpersonal communication. Symbols over the globe are taken from the phonetic alphabet, which enables the correct pronunciation of words in different languages. The map on the security strip shows the language regions of Switzerland and its neighbouring countries; in addition, the names of all Swiss cantons are listed. The parliament – a forum for public debate – represents Switzerland’s communicative side. The illustration of an open network references the denomination’s theme, communication. There are many other design elements on the note, all of which illustrate its theme of communication and its key motif, language. 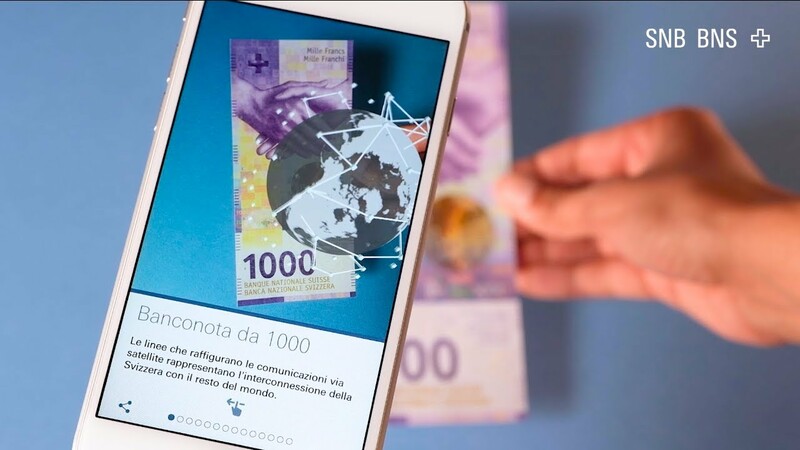 Discover the new note with the SNB’s ‘Swiss Banknotes’ app.